My edition: Paperback, published on 14 March 2013 by Quercus, 377 pages. Description: Annie Delancey is happily married with three grown children. But she guards a secret. Aged eighteen she had a baby boy, and gave him up for adoption. Now, the presence of the son she has never known begins to expose the flaws in the family Annie has to try to hold together. Tangled Lives touches upon the difficult subject of giving a child away for adoption and the implications it has both on the parents as well as on the child itself. They may not have been in each other's lives for 35 years but that doesn't mean they're not in each other's thoughts, or their blood band doesn't influence them one way or another. When Daniel's beloved adoptive mother passes away he feels the need to connect to someone else and he contacts his birth mother in the hope that they can meet. When he does meet Annie the two get along well and as he quite quickly takes a prominent part in her life this change ripples in unexpected ways through her family. Good and bad. There's jealousy and misplaced anger, but there's also the undeniable connection between half-siblings who despite not growing up together simply click. Part of the novel reminiscences real life stories like The Imposter as the reader starts to doubt whether everything Daniel claims really is in fact the truth. Just because he has a blood band to Annie, what is to say he is to be trusted? Particularly when someone who's been a part of the family for far more years claims that Daniel is not who he seems to be. The novel doesn't always develop as the reader would want it to, with imperfect characters making selfish choices blinded by love and jealousy, but then that only makes the story more realistic. 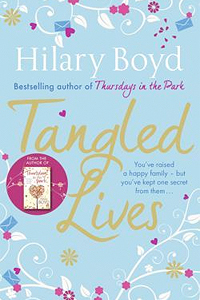 Tangled Lives was an engrossing read from start to finish and it definitely makes me keen to check out author Hilary Boyd's first novel Thursdays in the Park. Many thanks to Quercus for a review copy of the novel!